There’s nothing like a round of golf in Colorado to make you feel better about your game. Just tee one up and see how far it flies. You can experience high altitude golf and hit the ball 15-20% farther than at sea level! Peppered throughout the state, you’ll find award-winning courses catering to any skill level and designed by the biggest names in golf. 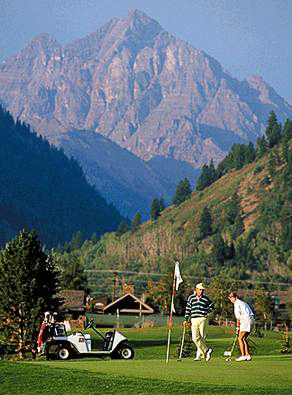 Golf in Colorado is special because of the variety of golf courses that are offered. Colorado’s terrain and elevation make for countless golfing experiences. With soaring mountain peaks, rolling hills of forest, colorful swaths of desert and golden plains set beneath a beautiful blue sky, Colorado’s terrain is the perfect canvas for the world’s elite golf-course architects who have crafted some of the finest courses in the nation. There are traditional forested, parkland-style courses with tree-lined fairways and undulating greens. Desert-style courses, with mounds, native areas and firm playing conditions to the most scenic and dramatic beauties of incredible mountain golf that attracts players from all over the U.S. The variety doesn’t get much better than that...unlike any other U.S. or worldwide golf destination!